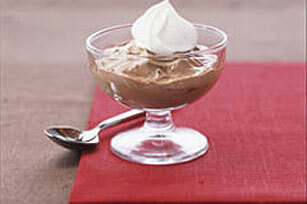 This Healthy Living Mocha Mousse is made possible thanks to fat-free milk and COOL WHIP FREE Whipped Topping. Pour milk into medium bowl. Add coffee granules. Beat with whisk 2 min. Add dry pudding mix and cinnamon; beat 2 min. Stir in 1-1/2 cups COOL WHIP. Refrigerate 1 hour. Top with remaining COOL WHIP just before serving. For stronger coffee flavor, increase instant coffee to 2 Tbsp. Serve in 1-qt. bowl instead of the individual dessert dishes.